Walt and Joan Flowers were nursery owners (Moon Nursery) in Pennsylvania who made frequent trips to Oregon and California to obtain nursery stock and pursue their rising interest in wine, especially Pinot Noir. In 1989, they purchased 327 acres high above the Pacific Ocean on the northern Sonoma Coast in Cazadero. At the time, only Hirsch and Bohan were in the desolate region. 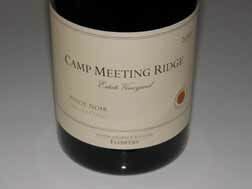 They eventually planted 33 acres of Pinot Noir and Chardonnay on the property's ridge top at elevations of 1150' to 1400' beginning in 1991, matching rootstocks to soil types. The site turned out to be warm enough to ripen grapes yet was heavily influenced by the close proximity of the Pacific Ocean (2 miles away) which provided cool morning fog below the ridge top and afternoon cooling breezes. 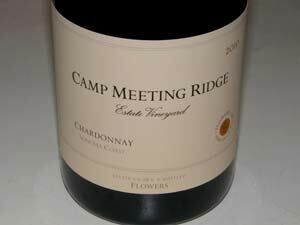 The ridge was named Camp Meeting Ridge after the Pomo Indians who camped in the area in the summer and later settlers camped there for religious retreats. In 1997, a gravity-flow winery was built on the property specifically for Chardonnay and Pinot Noir. In 1998, an additional 327 acres was bought and named Flowers Ranch. This property, like Camp Meeting Ridge, was less than two miles from the Pacific Ocean, but it had two ridges with elevations of 1400' to 1875'. 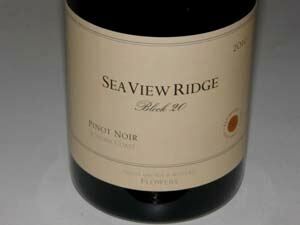 47 acres of Pinot Noir were planted from 1998-2001. Two vineyards were designated within Flowers Ranch, the 25-acre Frances Thompson Vineyard and the 22-acre Sea View Ridge Vineyard. The winery was expanded in 2003. Today, 648 total acres are owned, of which 77 acres are under vine. Flowers Vineyard & Winery is now one of three bonded wineries in the northern Sonoma Coast. Neighboring vineyards include Hirsch, Marcassin, Bohan, Charles, Hellenthal, Nobles, Blue Slide Ridge (Martinelli), Failla and Pahlmeyer, all of which are in the Fort Ross-Seaview AVA. The Sonoma Coast Pinot Noir is the workhorse of the winery and is consistently a fine representation of the true Sonoma Coast viticulture area. 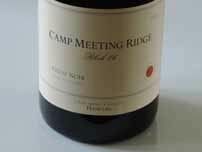 A number of other estate cuvee and vineyard-designate bottlings are now produced, with Andreen-Gale, Moon Select, Camp Meeting Ridge, Frances Thompson, and Sea View Ridge being the most recognizable. There have been a number of talented winemakers at Flowers who have gone on to distinguish themselves at other wineries or through their own labels. These include, Steve Kistler, Greg La Follette (Jim Ball Vineyards, Tandem, Londer, De Loach), Hugh Chapelle (Lynmar), and Ross Cobb (Cobb Wines). Darrin Low arrived in 2008 and was replaced by Jason Jardine, formerly of Rhys Vineyards, in 2010. David Keatley, who joined Flowers in 2008, became head winemaker in 2014. The viticulturist is Larry Bradley (since the early 1990s). Production is about 3,000 cases per year of estate grown Chardonnay and Pinot Noir. In January, 2009, it was announced that Huneeus Vintners, the wine company owned by the Huneeus family and owners of Quintessa Vineyards in the Napa Valley, had bought a substantial interest in Flowers. Tom Hinde, Flower's president since 2006, was retained to maintain consistency. Joan and Walt Flowers retired from their project. 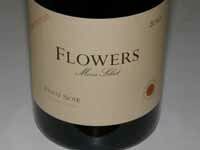 Flowers wines are sold almost exclusively through a mailing list with decent retail distribution of the Sonoma Coast Pinot Noir and limited distribution of other bottlings. Tours and tasting are by appointment for those adventurous enough to make the trek to the winery outpost in Cazadero (avoid winter months as the area has heavy rain and roads are dangerous). Driving up Highway 1 from Bodega Bay there are stunning seashore vistas scant yards to the left, and sometimes the driver is forced to slow to 5 miles an hour behind farm trucks. Once you turn off on Meyers Grade Road, the fun really starts. You climb up and up to 1,500 feet above sea level, twisting and turning beside steep, plunging forested ravines, before entering the gate to Camp Meeting Ridge. 707-847-3661.